to bore-brushing and barrel cleaning intervals. Many long-range shooters clean their barrels infrequently, and brush minimally (and in some cases not at all). “Point-Blank” benchrest competitors, as a rule, clean very frequently, brush aggressively with bronze brushes, and regularly use abrasive compounds like JB. If frequent cleaning works best for the 100-200 yard game, why has it fallen out of favor for longer range shooters? Could it be that the relatively short competitive life of point-blank barrels is associated with aggressive cleaning methods? Is there a middle ground suitable for all disciplines? Can alternative products, such as Wipe-Out Foam, reduce the need for labor-intensive cleaning with rod and brush? We polled a number of barrel-makers, short- and long-range shooters, and gunsmiths about their preferred barrel cleaning methods. Their answers may not resolve the question “How often should I clean my bore?”, but their opinions certainly give one reason to re-think what is most beneficial for accuracy and barrel life. 1. Each barrel is different. Some may clean up fast with just patches; others may demand scrubbing with bronze brushes. You may have to experiment with longer/shorter cleaning intervals and various solvents to find the right system for your barrel. In general however, we think most people can brush much less than they do currently. 2. High velocity rounds tend to shed more copper than lower velocity cartridges. A no-brushing routine that works well with a 2700 fps .308 may not suffice for a 22BR running 3800 fps. 3. It is vital to use a proper-fitting cleaning-rod bore guide. Even a Sinclair cleaning-rod guide will allow the rod to bow enough to contact the rifling–not a good thing. Ideally, use a bore guide, such as the Lucas guide, that has a secondary insert tightly-fitted to the diameter of your particular rod. 4. Monitor your results on paper BEFORE you adopt an aggressive brushing regimen. You may find that your gun shoots better when fouled a bit. It is generally NOT necessary to clean down to bare metal each time. 5. Some powders really do burn cleaner than others, and a particular powder may burn much cleaner at the upper pressure ranges than it does with a moderate load. 6. Try using Wipe-Out. While it is not the most ferocious copper cleaner out there, most of us who’ve tried it have found that it gets the barrel to a near-optimal level without “over-cleaning”. This means your accuracy (and zero) will come back with just one to three fouling shots. Wipe-Out is most effective if you run a few wet patches through the bore before applying the foam. Wipe-Out Accelerator will reduce the dwell-time required. 7. Carb-Out (from the makers of Wipe-Out), Slip-2000 “Carbon Killer”, GM Top Engine Cleaner (TEC), and TM Solution have all proven to be extremely effective on carbon. When used with a bronze brush, and sufficient dwell time, Carb-Out have proven effective even on the most stubborn carbon deposits. For removing serious copper fouling, Montana X-treme 50BMG, and Sweet’s 7.62 lead the pack. Don’t leave Sweet’s in your barrel too long, however. 8. A bore-scope is an invaluable tool that will let you see what’s really going on inside your barrel. We recommend the Hawkeye BoreScope from GradientLens.com. Since I shoot moly, my cleaning procedure is different than you’d use with naked bullets. I went to moly so I wouldn’t have to clean during matches. Now I’ll clean every two matches–about every 80 rounds. Here’s the procedure: I put a patch of Kroil through the barrel, then wet another patch with Kroil, stroke it pretty good, then I dry patch it. Next I run a couple Montana X-Treme 50 BMG wet patches and I let that set for 5-10 minutes, then dry-patch the 50 BMG out. Then I put a little JB on a dry patch on a jag, and short-stroke about 6-8 inches of the throat area for about a dozen strokes. After that I push another Kroil-wetted patch through again, and then wet/dry patch to remove the JB residue. The last step it to run a patch with Kroil. This complicated process gets the barrel clean but I’ve found it may take a dozen or more shots to get the moly back in again so the gun shoots optimally. If somebody has a better/faster way to clean for moly bullets, that doesn’t require so many fouling shots, I’m all ears. I generally don’t use brushes, but when I do, I’ll use nylon brushes (except in rare situations where I really need to attack carbon in the throat). Bill Shehane was the one who suggested I use the nylon. With a nylon brush I will send the brush all the way out the muzzle and draw it back in again. With a fairly loose-fitting nylon brush I can short-stroke the throat area (you can feel it if it’s getting rough), but generally that’s not necessary, and, as explained above, I can accomplish my cleaning with patches. 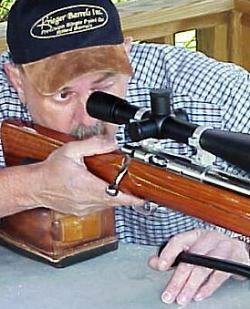 For benchrest barrels–99% of the time a good, clean barrel shoots the best. The cleaner you can keep it the better you are. In true benchrest competition,, cleaning every 10-15 rounds is fine, and normally I’d clean after every group. The only drawback is that the first lubed shot is a little wild and you get impact shifts. In other situations, I prefer to clean every 20-30 rounds. I believe in using bronze brushes. A nylon brush may be good for your teeth but it won’t do the job on a rifle barrel, particularly in the throat area where carbon and the initial fouling forms. That can be a real problematic area to clean, with tooling marks that grab fouling. When using a bronze brush, however, don’t reverse it inside the the bore. If you reverse a bronze brush, the bristles, at some point, will be sticking straight out under high loads and that could cause some surface scratching. For barrel cleaning, we’ve tried many different solvents and have settled on Witches’ Brew from Dave Holland. This is 1200 micron-inch aluminum oxide in Kroil. It removes carbon and copper very effectively–basically it’ll remove anything that isn’t gun-barrel steel. We shake it up real good and wet-brush in and out, making sure the brush is coated. Each time exit the muzzle and draw it back in slowly. Every three cycles recharge the brush with solvent. We’ll do 12-20 strokes total. Once we’re done brushing, we’ll remove the Witches’ Brew with 3-4 wet alcohol patches, followed by dry patches. You want to be sure to get all the Witches’ Brew out. The last step is a little Kroil. I’ve been asked about the abrasive bore cleaners. My advice is to proceed with caution. Use JB sparingly. A JB-coated patch wrapped around bristle brush becomes more of a surface lap than a cleaning agent. I’ve seen people actually lap a taper in their bore using JB on a patch. You want to clean your barrel, not change its dimensions! I’d just put JB on a bristle brush if you feel compelled to use it. In the score-shooting world we’ve evolved a much different cleaning routine than the PPC group shooters. I clean once per weekend. That’s as much as 200 rounds, sometimes three full Aggs. Some guys might clean after a day, but nearly all the top guys, including Dean Breedan and David Apple, are cleaning very little during a match. My cleaning procedure is as follows. I start with two patches soaked with Shooters Choice. Then I follow with one patch saturated with JB (the original brown formula), which I short-stroke the full length of the barrel. Next comes a dry patch to push most of the JB out, followed by two wet patches. The final step is two dry patches to get the solvent out. I’ve shown this cleaning regimen to “Humble Henry” Rivers and he does pretty much the same thing, as do David Apple and Dean Breeden, though they may use a different solvent. Dean was the top score shooter in the country last year, winning a bunch of matches and capturing IBS Shooter of the Year honors. Dean’s match barrel now has over 8600 rounds through it. What does that tell you, when you see PPC guys wearing out barrels in 700 rounds or less? Yes, the 30BR is a different round, in a larger bore, burning different powders. But it does make you wonder whether PPC barrels might last longer if those guys cleaned less often. I developed my cleaning method after seeing the effects of over-cleaning during a prairie dog shoot in South Dakota, on the Wyoming border. I took the throat right out of two brand new Hart barrels using Rem Clean and brushes too aggresively. That Rem Clean took about 1.5″ of lands right out of one barrel. Ever since then I’ve steered away from cleaning often and aggressively. Will the PPC group shooters evolve a different cleaning style? That won’t happen until Tony Boyer changes what he does (or somebody wins the Super Shoot after cleaning just once a day). I can say that, when I was a group shooter, I would clean once a day, every 50-70 rounds. With Danzac that’s actually pretty conservative. For me, the results were very good, and I don’t think my accuracy suffered. I usually clean with TM Solution, wet patches, and a nylon brush. I normally clean every 30-40 rounds. The longest I’ve run between cleanings is 40-50 rounds. The exact interval depends on the barrel I’m shooting–each barrel has its own quirks. But in a 600-yard match I normally won’t clean until the end of the match. The TM works really well on the carbon. I’ll wet-patch the TM followed by a nylon brush. The wet patches with TM normally dissolve the carbon so the brush is not gritty. The carbon just kind of melts away with the TM. I borescope after every match. Most of the time I don’t see anything to worry about. On short-range I was cleaning every relay, but I think I may have been doing more damage than good. Now I clean about every 20 rounds. At a 100-200 yard match, I’ll clean every other relay with TM and nylon brushes. I do think that some guys are cleaning too much. A lot of guys complain about stubborn carbon in the throat area. This hasn’t been too much of an issue for me. Normally I have enough solvent “backwash” that the throat gets clean. In other words, enough TM Solution reaches the thoat to dissolve the carbon. The TM keeps it flushed out–it just doesn’t accumulate. As noted, I borescope after every match. If I see a copper problem, I’ll first try soaking it out with Montana X-Treme 50 BMG. If, after that, the bore-scope still shows copper build-up in in the corners of the lands, I’ll use a bronze brush. The nylon brush bristles aren’t fine enough to get that out. I’ll take a bronze brush and sometimes wrap 0000 steel wool around that if I get stubborn copper. Normally that will just be in the throat area, but if I’m running real fast loads it can show up elsewhere. I want to caution people that using steel wool on a bronze brush is sort of a last resort. I think the steel wool can scratch stainless. Also, ONLY use this method with an UNDERsized brush. I stop short of the muzzle with the bronze brush so I need to be able to reverse it. You can’t do that with a tight-fitting brush. Also, anytime I use JB or any other abrasive I stop 1/4″ short of the muzzle. I put a tape marker on the rod so I don’t go too far. 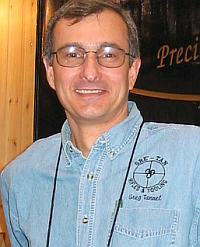 We had a chance to talk to barrel-maker John Krieger at Show Show. We discussed the use of bronze brushes for barrel cleaning. John observed that he prefers not to use bronze brushes on his barrels. He also feels that it is wise not to draw a bronze brush backwards across the crown. He explained: “The brush is soft, but the stuff it drags with it, primer residues and so on, are not soft, and they can harm the crown.” Also, on his personal guns, when John cleans with a patch, he tries to avoid running the patch and the jag past the muzzle. When cleaning, he places the rifle so the muzzle butts up against a wall. When the tip of the jag hits the wall he draws it back through the bore and removes it from the breech end. John notes that damaged crowns “can make the barrel look like it’s shot out when it’s not.” Here are two video interviews with John: Kreiger 1 min (11 megs), Krieger 2 min (23 megs). I know some people avoid using bronze brushes. In my view it is OK to use a bronze brush, and to run it past the muzzle. I also don’t see a problem with reversing the bronze brush and running it back through the bore. However, you should never reverse a tight-fitting brush while it is in the barrel. I don’t recommend nylon brushes. I don’t think they work any better than a patch. However, when using bronze brushes, you should make sure they are not bent off-center–a bent brush running over the crown at an angle can definitely cause damage. When you put a new brush on your rod, rotate the rod to ensure the brush is straight. When brushing, you shouldn’t use a lot of force, and try to keep the rod as straight as posssible. Keep the brush damp with a good solvent. I like Butch’s Bore Shine. How often should one clean a barrel? It depends on the barrel’s intended use and the design. I do think my 3-groove barrels require less brushing since they don’t copper-foul as much as other barrel types. With a 6BR or 6PPC barrel used in competition, cleaning every 15 shots or so seems reasonable. 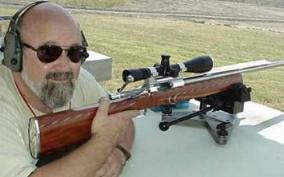 With benchrest rifles, I clean every other group or so–that’s about ten shots plus sighters. I have shot an entire Agg without cleaning, 60-70 shots or so including sighters and foulers, but I think that’s too much and I wouldn’t do it again. If you brush correctly, I don’t think cleaning with a bronze brush will shorten the life of a barrel. In fact, I think that frequent cleaning will help a barrel maintain its accuracy longer. However, over a period of time, the crown will wear some. For peak accuracy, it is a good idea to re-crown the barrel every 400-500 rounds. I also like to remove powder/carbon fouling first, then remove any copper fouling that remains. This way you present clean metal to the copper solvent, so it works better with less brushing. When cleaning out copper, be patient, follow the directions, and let the solvent do the work. I like the Montana X-Treme Products, particularly the Copper Creme, but there are many products that work. I’ve used Iosso Bore Paste to attack a spot of stubborn carbon build-up on occasion. 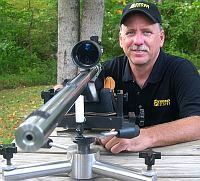 Among the Montana X-Treme products, I use 50 BMG, the copper solvent as needed, and the bore conditioner or oil. About brushes–both bronze and nylon brushes work. A bronze brush will definitely knock out stubborn carbon fouling easier, but in my barrels I normally use a nylon brush. This way you don’t get “false readings” from the solvent dissolving bronze bristles. Nylon brushes are also gentler on a barrel. You just may need more brush strokes with nylon. If you DO use a bronze brush, NEVER drag it back through the muzzle. When dragged backwards, the bristles can abrade the delicate crown, causing small scratches that can degrade accuracy. Also, use good brushes. If the bronze bristles are bent or broken they can mar your barrel. How often should one clean? It really depends on your discipline. Most guns can go 30-40 rounds between cleanings. That’s a good number as a MAX in most situations. When you start to get around 60 rounds with dirty powders your groups start opening up. I’ve found, with RL 22, something happens at 40-60 rounds. In one championship I saw my groups open way up at 85 rounds, so I cleaned and it came down to 6″ at 1000. For the short-range BR guys, they clean as frequently as they can. Each discipline has its own shooting cycle that controls how often one can clean. 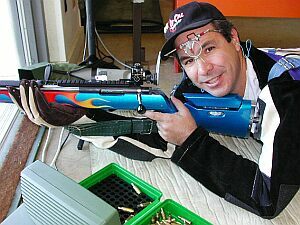 At a highpower match, you may have to shoot all day long with no chance to clean, so the cleaning interval has to be longer. In prone Highpower shooting at 300 Meters, 500 or 600 yards, there is rarely any opportunity to clean a rifle during the course of fire. I shoot the 6BR in these matches and have found no deterioration in accuracy at all as the day progresses. Matches are 60 record shots with another 6 to 10 shots fired as sighters, so we are typically firing 70 shots before the barrel sees a cleaning rod. I shoot moly-coated bullets (Berger) which I believe help minimize fouling in between cleanings. My cleaning actually begins immediately after the last record shot is fired. I shot a Tubb TMS (Throat Maintenance System) bullet through the rifle as the last shot. The TMS bullet has a very fine abrasive embedded in. Its main purpose is to keep the throat smooth, which, of course, should and does lessen fouling in that area. While I use bronze brushes, I don’t make too many passes down the barrel with them. Using a borescope as part of every cleaning has really helped me see what’s useful for my barrels and what isn’t. I begin with three patches wet with Shooter’s Choice and Kroil to loosen the carbon and remove the loose debris. This is followed by 6 or 7 passes with the brush wet with Shooter’s Choice, removing the brush at the muzzle each time. While those who do their own gunsmithing work might not have any qualms about pulling the brush back, I do whatever I can to protect the crown because it’s always a long and expensive process to get my rifle to the right gunsmith even for minor work. Three more patches of Shooter’s Choice/Kroil finishes off the initial portion of the job. At this point, I don’t see any more carbon in the barrel through the borescope though there is frequently some copper fouling left, particularly on older barrels. I don’t think that brushing is an effective way to remove copper; I prefer to let chemicals do their job over a period of time. So, if there’s any copper left to remove I use Montana X-Treme and run a patch through every 10 or 15 minutes until I’m satisfied (by scoping) that the copper is either gone or down to an insignificant amount. I don’t try to make a barrel look unfired with my cleaning routine, I simply get it clean enough that it will make it through the next 70 rounds without losing accuracy due to carbon or copper fouling. This method has been effective in doing that with the 6BR and moly-coated bullets. The barrel on my main rifle is now over 2900 rounds and the accuracy has not deteriorated at all since new. I also believe one needs to look at barrel break-in. I believe proper break-in will reduce a barrel’s propensity to foul (and hence the need to clean frequently) over the life of the barrel. I recommend doing the one-shot, one-clean routine for 10 shots. Use a good solvent, and brush for ten strokes per shot, letting the solvent soak in and work between each shot. There are many good solvents–Sweet’s, Hoppes, Shooter’s Choice. Whatever you choose, you want to make sure to get all the solvent out before you start shooting. You want to shoot a dry bore and a dry chamber. If you leave even small amounts of liquid in the bore, when you fire a bullet, you can actually put tiny dents in the steel. This is caused by the bullet rolling over incompressible droplets. For the carbon build-up in the throat area, I don’t think you need to treat that differently than fouling elsewhere in the bore. I discourage the use of abrasives. JB is a 1200-grit lapping compound. When you use it aggressively, some of that black you see on the patch is barrel steel. JB and Rem-Clean can remove steel and, in my opinion, used to excess, these products will decrease the life of the barrel. Yes I know Tony Boyer uses lots of JB. But he keeps a large inventory of barrels and he has no compunction about wearing out a barrel. Most shooters demand longer barrel life and hence should avoid using abrasives. I agree with Dwight Scott that it is important to have a good guide rod and a coated cleaning rod. If the cleaning rod bends it will contact the lands and that is undesireable. When a barrel has been abused, we see a pattern where the rod abraids the rifling in the area just forward of the chamber. The damage is most common on the lands in the leade section of the chamber. This is most extreme with an uncoated cleaning rod that is bowing and bending. I also see crown damage caused by improper cleaning techniques. While it is fine to let your brush go past the muzzle and then return it through the bore, you want to be careful on that return path. Don’t draw something back into the barrel that will grab the crown. That can be the base of the jag, the ferrule shoulders on the rod, or the shoulder of the brush. Any one of these edges can damage the crown if it snags on the way in. First let me say, if you talk to the top ten guys you’ll find ten different ideas on the best way to clean and brush a bore. Everybody has their own way of doing it. 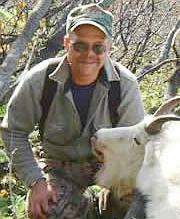 My method has has worked for me for over 22 years, but other shooters may have devised other methods that work just as well for them. While I clean my rifles very thoroughly, I do believe too many guns are over-cleaned. I know one guy who wiped out his throat in less than 80 rounds. I also don’t believe in barrel break-in routines. I just don’t do it since I don’t know what you’re trying to achieve with the one shot, one clean ritual. That said, I do brush my rifles, usually every 20 rounds or so. And when I brush, I do a thorough job. First, I run a couple wet patches to get rid of the bulk of the crud. Then I give it about 1.5 complete strokes per shot fired. That means, after 20 shots fired, I’ll do 30 up and back cycles with a wet brush, adding more solvent (Butch’s Bore Shine) after every ten complete cycles. I guess you could call that a heavy brushing regimen. Am I cleaning too much? I don’t think so, if we really examine what’s happening to the barrel. First, let’s consider barrel life. Some people say heavy cleaning shortens barrel life. But I’m skeptical of that claim. Most barrels don’t wear out–they burn out. I’ve looked through a borescope, and some barrels look really bad in the throat area after just 200-300 rounds. We’re talking about heat cracking and pressure-related surface flaws. From this I conclude that heavy brushing doesn’t wear the barrels out–heat and pressure are the culprits. What about throat erosion? Some people say heavy cleaning wears out the throat prematurely. But, as heavy as I brush, I see very little evidence of the throat moving forward. Here are some tips on brushing. First, it’s fine if the brush exits the muzzle. At the end of my out-stroke, I have the entire brush exposed. If you have a proper, tight-fitting brush, you can’t reverse it in the barrel, so you need to exit the muzzle to brush both ways. If you look at the absolute top shooters, including Tony Boyer, they all stroke the brush both ways. Yes, I know some people advise removing the brush at the end of the out-stroke, but as far as I’m concerned, life is too short to be bothered with that. Next tip–don’t scrimp on brushes. I never use a brush more than a day, which is about 5-7 cleanings. That’s because I want a very tight-fitting brush. These brushes aren’t all that expensive. Toss a brush if it isn’t tight-fitting. Also, you should always straighten out a brush before you use it. Bent brushes can drag unevenly on the muzzle. 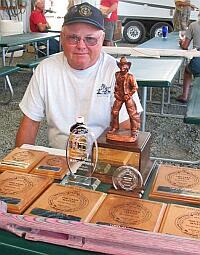 Bore Guides–I think having a properly-fitted bore guide is vital. An awful lot of people think that so long as they use any old bore guide they can’t hurt their barrel. Not so. They’ll arc their arm when cleaning, and that will cause the rod to bend. A lot of people wear out their barrel in the critical area of the throat by improper use of their cleaning rod. I think bowing of the cleaning rod is one of the biggest problems I see. If you can get a patch through your bore guide, it means that the rod can touch the lands and throat which can cause damage. If you have a tighter-fitting cleaning rod bore guide, it is much more difficult to make this common mistake. I use custom-fitted rod guides and that’s why I don’t see much throat erosion (from abrasion). Over both of my cleaning rods I have a 13″-long stainless sleeve over the rod that runs inside the bore guide with just about .001″ clearance. T.K. Nollan makes something similar, the “Barrel Saver“. The Lucas bore guide is similar but the tight section is only 4” long. I also use two cleaning rods–one for brushing and another for use with patches. I glue the jag on to one rod, and glue the brush adapter to the second rod. This way the jag or brush can’t come unscrewed, leaving a gap or ridge that can catch on the crown. To further eliminate the chance of damage to the crown, throat, or rifling, you should spend some time cleaning up the connection point between the brush/jag and the cleaning rod. Take a little file to the junction point and smooth the edge where the jag or adapter meet the rod–they are invariably off a little bit. If you do that, you’ll ensure there are no sharp edges that will catch on the muzzle. When it comes to bore maintenance, I’ve tried everything over the last 35 years. These days, I’m not using anything but nylon brushes for normal cleaning, and I’m going longer intervals between cleanings. I do believe I’ve cleaned too much in the past, so I’m experimenting with cleaning less. Currently, with my Light Gun, I’ll shoot 20-30 rounds max, 40 rounds absolute max, and then I’ll clean. With the Heavy Gun, now I’ll shoot 40-45 rounds between cleanings. I used to shoot 16-18 rounds between cleaning. I know I wrecked some crowns with JB going out the muzzle. Most of the 1K shooters today have found out that they don’t need to clean every 10-15 rounds. I’d say most people will shoot the whole match and not clean until the match is over. I know for a fact that some of the top 1000-yard shooters in the country are shooting well over 100 rounds between cleanings and they are right up there in the standings. For normal cleaning I use regular Montana X-Treme liquid solvent, with Montana X-Treme Bore Creme every other match or so (100-150 rounds). I use 50 BMG for break-in or if I have a barrel that is giving a problem with copper fouling. (Using the 50 BMG during a break-in procedure, after 15-20 rounds the new barrel is ready to go.) I used to use JB pretty religiously every 100-150 rounds. Now I use the MT X-Treme bore cream in a syringe and it works just as well as the JB and it’s not as abrasive. If you use it in the throat area every 100-150 rounds I find you can keep the carbon build-up under control. There are a couple reasons I prefer nylon brushes. First, with a bronze brush, the solvent will give you a false reading. Plus I can reverse a nylon brush inside the barrel. But all nylon brushes are NOT created equial. Sinclair now has some good ones, and Western Powder has some good ones. You want a nylon brush to be stiff. Whether you use bronze or nylon, you need to be careful–damage can occur when the rod exits the muzzle and the rod shaft drops on the crown and rounds the muzzle. That’s true for any kind of brush. To avoid this problem, I do the same thing as John Krieger–I place my barrel up against a wall. That way the brush never exists the barrel. But with a patch I’ll send it out just far enough for the patch to exit and be removed. But I try to keep the rod shaft from touching the crown. Contact with a bronze bronze, by itself, normally won’t hurt the muzzle. The hurt comes from the rod slamming on the rifling, and dragging abrasives backwards across the crown. Everytime you go past the muzzle you are lapping the very sharp edge you took great pains to make square and that can can kill accuracy. Everybody knows the a good square crown benefits extreme accuracy. If you jerk a brush back across the crown, the tack-driving accuracy can go. You also need to be careful when using patches, because where the jag meets the end of the rod there can be a little lip that can catch the crown and nick it. I’ve been asked whether the short-range benchrest guys might benefit by cleaning less frequently. I can only say that the 100-200 yard game is a different world. At 1000 yards, we’re shooting 50-70 grains of powder vs. 28-30 grains. Different procedures are called for. Those guys know what works for them. But there is a definite trend in my game to clean less and minimize brush/jag/rod contact with the crown. I’ll say flat-out, I don’t think brushing with a bronze brush reduces barrel life. If you use a proper-fitting bronze brush with a good rod guide and proper technique you won’t hurt the crown by brushing. Benchrest barrels do benefit from re-crowning every 500-700 rounds. But is not the brush–it is the gas and unburnt powder that erodes the edge of the muzzle. I strongly believe that benchrest barrels perform best when they are super-clean. And to get a barrel clean enough you must use a phosphor bronze brush. You can’t clean the corners of the lands and grooves adequately with just patches. If you are using a proper-fitting, quality bronze brush (don’t use the cheap ones) you won’t hurt the crown–provided you employ the right technique. Don’t clean the barrel like you’re sawing wood–that can damage the barrel. You need to slow down on the back stroke. Jerking it doesn’t give enough time for the bristles to fold back. If you do it as you should the brush witll center itself and fold back. You can’t be snatching it. You should push the brush out easy, and then pull it back easy. And you want to keep the ferrule end of the rod from dragging on the muzzle. There is a crown-saver product that can help reduce this problem. I disagree with those who advocate unscrewing a brush after the out-stroke. The brush is designed to clean in both directions. You can do more damage from the rod resting and sliding on the crown as the brush is unscrewed than from drawing the brush back through the muzzle. As far as solvents and cleaners go, I recommend TM Solution. It won’t hurt your barrel, and everyone who has bought TM from me has been back for more. I’m not impressed with the foam cleaners. They don’t work as well as Sweet’s for copper and they are slow. The 1000-yard shooters are using Sweet’s on nylon brushes. The nylon agitates the Sweet’s and that helps remove the copper. They clean after every match, probably 15-20 rounds. JB bore paste, if you use it properly, will never hurt the barrel. I know that Tony Boyer has used lots of JB, and he cleans after every Aggregate. He uses JB on a brush, scrubbing back and forth in the back half of the barrel. When using JB like that, a nylon brush is appropriate. And when you’re finished you need to wet patch with a solvent to get all the JB out. If you leave residue, it can act like a lap and remove steel. How often should one clean? My rule of thumb is you should let the gun tell you at what point the fouling is causing a loss of accuracy. It might be nine shots, it might be 10-15. If you’re shooting a 17-caliber it could be after 7 shots. But whatever that number is, if you go over it, fouling will reduce the ultimate accuracy potential of the barrel. The longer you go the more fouling you’ll build up, and if you can feel it with a patch it’s not good. Over the years I know if you get fouling in the barrel your groups will start opening. That’s my story and I’m not going to change. Moreover, if you don’t clean properly you can hurt a barrel. I’ve seen this with a borescope. If you run bullets through a dirty barrel, you deposite more layers of carbon and copper in the bore. That will just continue to make things worse. You can also damage your barrel if you’re not using a good cleaning rod that is properly fitted to the bore guide. With a loose-fitting guide the cleaning rod can bow, and you can hit the throat with the bore guide. I think more damage is done to the THROAT with the cleaning rod than is done to the crown. It’s both impact damage and abrasion. Bottom line, if your rod is bowing during the cleaning process you’ll get a problem. The bottom of the throat would get worn out. Here is the cleaning procedure I follow. I start with a wet patch. That first patch I’ll work back and forth, paying particular attentinon to the throat area and the muzzle section. Next I’ll run 3-4 more wet patches and then I’ll switch to a brush. I wet a tight-fitting bronze brush and stroke all the way out the end and draw it back. The whole brush exits the muzzle, before I reverse it. And before I bring it back in I’ll rotate the brush a quarter turn. I’ll make one trip up and back with the brush for every shot I’ve fired (but I’ll never short-stroke it). I’ll re-apply solvent about half way through the brushing procedure. After the brushing phase, I’ll run another 3-4 wet patches through the bore. And then I’ll leave it sit wet for a minimum of 30 minutes. Just before I go back to the line I’ll run 3-4 dry patches through the bore. The final step is one patch with a very small amount of Kroil or Butch’s oil, just to lubricate the first fouling shot. In addition to the regular cleaning procedure, if the barrel begins to feel rough, I may use some JB on a patch in between Aggs. But it depends on the barrel. With some of the new barrels I may not use JB in a match at all. With other barrels, if they start exhibiting fouling, in between Aggs, I’ll use JB. I prefer the JB Red Rouge. I apply it to a tight-fitting patch on a jag and I will start at the throat. I focus on the throat, then go the whole length, and finally short-stroke the last four inches or so. I generally try to start a major match with a new barrel (50 rounds or less). A big match will put 200-300 rounds through a barrel. I’ll continue to shoot that at local events. After 500-700 rounds I won’t take it to a big match. We recommend you use a bore guide, a coated cleaning rod, and Shooters Choice or Hoppes #9. Both those products remove carbon and copper fouling. We haven’t seen any foam cleaners that clean as well as the two products we recommend. We’ve observed that some other cleaning products (both abrasives and liquid solvents) can harm barrels, but I don’t want to get into specifics. The procedure we recommend is to use a wetted bronze or brass brush, and draw it back and forth through the barrel four to six times, then re-wet the brush, and repeat five to six times. When brushing, send the brush out past the muzzle and then pull it back through gently, allowing the bristles to re-orient to the new direction. We’ve been in business 54 years and we believe that bronze brushes will not damage your crown. Stainless brushes will damage barrels very quickly, however. Some people try to get their barrels too clean–you truly want the bullet to ride on a little carbon or copper. Both the carbon and copper provide a little bit of a lubricant in the barrel. One doesn’t need a squeaky-clean barrel. You need to condition the stainless steel–to leave a little film in there. We do recommend that you clean the barrel as often as you can. If you shoot a “hot-rod” cartridge (big powder charge and/or very high velocity) you’ll need to clean more often. With a smaller case, such as the 6PPC, you can shoot 15-20 rounds between cleanings. Normally, with my BR gun, I clean after every group, that’s 5 or 10 rounds plus sighters. We believe that frequent cleaning promotes barrel life. If you don’t clean often enough, tight spots can form and you will start losing accuracy. Fire-checking will increase because you’ve got more build-up in the throat, and the inside of the barrel will become rougher, with more carbon. Ultimately you can shorten the barrel life if you don’t clean often enough. If I see one of my competitors at a match sawing his cleaning rod back and forth, with a bronze brush cycling quickly in and out of the muzzle, I’m happy because I know, sooner or later, that guy will harm his barrel. On the other hand, if a customer of mine does the same thing, I’ll caution him to stop. Like Tim North and John Krieger, I think we should minimize the use of bronze brushes, and avoid drawing them back across the crown if possible. It just isn’t that difficult to unscrew a brush at the muzzle and re-attach it before a second stroke. And think about this–your objective in cleaning is to remove various types of fouling and contaminants from the bore. If carbon, grit, and fouling by-products are present on your brush, why would you want to draw that back into the bore? For regular cleaning, I don’t have one set regimen. I select a method for a particular barrel based on what my borescope inspection reveals. I have some barrels that will clean up with just three or four wet patches. Such barrels might shoot 200 rounds or more accurately before anything (other than wet-patching every 30-40 rounds) is required–and then all they may need is a good soak with Slip 2000 Carbon Killer. With other barrels I may need to clean with a nylon brush and a 1000-grit or finer paste IF the borescope shows a heavy carbon build-up. Empirically I’ve found that, when a barrel rather abruptly starts grouping real badly–you’ve probably got a carbon problem. Then I’ll go in with JB, USP Bore Paste or KG2 Bore-restorer on a nylon brush. With a third class of barrels, the real foulers, I may need to use a bronze brush to remove copper and carbon between record strings. Many people believe that, since brass or bronze is softer than steel, a brush can’t scratch or mar a steel barrel. Well, if you’ve bore-scoped as many barrels as I have you would know that isn’t the case. Yes, drawing a bronze brush across the crown will abrade it over time. Moreover, the sharp tips of bronze bristles can leave micro-scratches inside your bore. If you reverse a bronze brush, the bristle tips can pit the bore. I’m not against bronze brushes per se, and I do believe there are barrels that may require regular brushing to perform their best. However, I also believe that many shooters are over-doing it, and that their barrels might retain that “gilt-edged” accuracy longer with less brushing, or at least more careful brushing. There are many ways you can mess up a good barrel during the cleaning process. You want to use common sense. Use a good bore guide. Be mindful of the little step between the base of a jag and the end of the guide rod–don’t drag that across the crown. Never reverse a bronze brush while in the barrel. 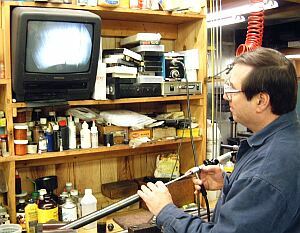 And, if you can invest in a borescope, use it to inspect your barrel before and after cleaning. The borescope lets you tailor your cleaning procedures to the barrel’s actual condition, so you only brush or use JB when that is truly necessary. By all means, if you can get by without using a bronze brush, do so. There is no glory in brushing a barrel aggressively, if wet-patching alone will do the job. This is controversial I know, but I do a LOT less barrel cleaning than most people do. I typically run a lot of rounds through the barrel before cleaning, and I rarely use a brush. In a multi-day match, with all the rifles I shoot, I’ll almost always wait ’til the end of the match before cleaning. Only if I experience something unusual, then I’ll go ahead and clean. Most of the time, I do NOT brush. I’ll use Shooters Choice, wet patches, one wet, two dry. Occasionally I’ll use a nylon brush, maybe every third cleaning–about every 300 rounds. On a Palma barrel I’ll go up to 500 rounds between cleaning, so that might mean 2000 rounds between brushing. I’ve developed this cleaning regimen based on my observed match results. I’ve found that my X-count peaked with the Palma rifle at the fourth or fifth match (about 200-300 rounds). Once I get about 200 rounds through the barrel, the X-count seems to climb for about 150-200 rounds then levels out. And then I’ll clean at about 400 rounds. I shoot moly in most every caliber if possible. I thoroughly clean or not at all. I’ll use a one-caliber oversize brass brush and Sweet’s 7.62. I’ll brush for about 20 strokes each way, keeping the brush wet with solvent. Cleaning the barrel that thoroughly will require you to season your barrel back (this applies whether you shoot bare bullets or moly-coated bullets). I figure most never notice this since they shoot their first shots at 200 yards or less. When shooting a longer distance (1000 yards) I like to see about a dozen shots through before I go for record. To show you the importance of “re-seasoning” your barrel, here is one example of many I have encountered. 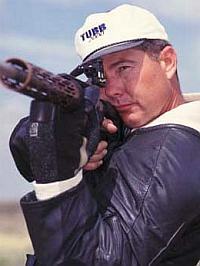 In 1995 I shot a match in Baily, Colorado, starting at 600 yards early in the morning. I cleaned the rifle as described above and even shot three foulers through it on the way to the range (nobody else does this do they!?) Anyway, I shot a 100-1X for the first 10 shots (plus two sighters to start the string) then followed up with a 100-9X using a 243 with uncoated 107gr Sierras. That shows you the difference between a “squeaky clean” barrel, and one which has been seasoned. Count me among those who are favoring shooting more and cleaning less. With my 30BR, using a Lilja 3-groove barrel, I’ve found I can go 80-95 rounds (five complete score matches) with no drop-off in accuracy. This barrel has shot .068″ for five shots, and, in the right conditions, that accuracy potential will hold for 100 shots or more. In my opinion some barrels will, indeed, retain their peak accuracy longer with less frequent brushing. I think you can clean too much. I used to follow the typical short-range benchrest cleaning procedures, but I don’t go that route anymore. Since I’ve extended my cleaning intervals and gone away from bronze brushes, I know that my accurate barrel life is as long or longer. I’m a firm believer in that. I attribute this to less contact damage to the crown, less scratching of the bore interior, and less abrasion/rounding of the sharp edges of the rifling. Basically, the less brushing you do, the less chance you have to damage the rifling and crown. There is also the possibility that the 30BR simply shoots better with a certain degree of fouling in the barrel. I’ve also personally witnessed the damage that can be done with over-aggressive cleaning. I had one barrel that I cleaned using Rem-Clean on a patch over a brass brush. (Rem-Clean is an abrasive similar to JB.) I made 10 round-trips through the bore, running the brush just a bit past the muzzle on each cycle. Then I went out and shot the gun. The groups were terrible and the last two inches of the barrel was packed with copper. I inspected what had been a nice shiny, sharp crown and it looked like it had been bead-blasted. I then measured the bore diameter at the crown and found that the groove dimension had increased .0002″ (two ten-thousandths). I ended up cutting a half-inch off the barrel and recrowning it, but the barrel still shot very poorly. It basically had been ruined for competitive purposes. Currently I clean with minimal brushing and I always check with a borescope before and after. I first wet-patch with Bore-Tech Eliminator, a product that cleans without ammonia. If that doesn’t do the job I’ll use a nylon brush with the BT Eliminator, running it the full length of the barrel a few times. If the borescope reveals persistent carbon, I’ll go after that with the Slip 2000 Carbon Killer. This is good stuff that works well. The minimal brushing routine is working very well for me now. But I will acknowledge that each barrel is different, and some barrels foul much earlier than others. In that situation, you may want to use stronger solvents or brush more aggressively. But anyone considering using abrasives on a tight patch should proceed with caution. Chris Dichter has observed that JB on a patch can work like a lap. I personally saw how Rem-Clean on a patch can behave similarly. First let me say that I don’t have the competition credentials of the other gentlemen on the page, but I do think my tale of brushless barrel maintenance is worth telling. On my Savage with Pac-Nor 3-groove barrel, I noticed from the start that it fouled very little and nearly all the visible carbon and soot would come out with two or three wet patches (Butch’s, Shooter’s Choice, MPro-7). To remove the remaining fouling, I simply apply Wipe-Out foam cleaner. After about an hour, once the bubbles have dissipated from the first application, I’ll fill the bore with Wipe-Out a second time. Four hours later I’ll dry-patch the barrel and then it’s ready to shoot again. With over 400 rounds through the tube, accuracy is as good as ever. The gun still shoots as well as it did in the beginning, and it recently delivered a 1.6″ group at 610 yards. My cleaning procedure may not suffice for registered benchrest, but for club-level fun shooters and varminters, you may find you don’t need to brush your barrel at all, or only need to brush very minimally every 150 rounds or so. Less brushing gives you more time for reloading and shooting, and using foam reduces the chances of messing up your crown/throat through impact damage or abrasion. You may just want to give my “lazy-man’s” method a try before you start sawing away with rod and brush on that nice new barrel. If you read through the many perspectives above, a few themes come through. 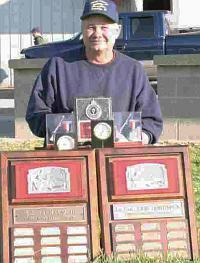 First, the short-range Benchrest guys are doing a LOT of brushing, while many of the winning 600- and 1000-yard shooters are cleaning fairly infrequently, and are NOT using bronze brushes. It also appears that most barrel-makers still advocate frequent cleaning with bronze brushes. However, I’m not sure most barrel-makers have actually studied the effect of brushing on barrel life in a scientific fashion, nor have they really explored the potential benefits of brushless cleaning alternatives. Now, many top “point-blank” group shooters toss their barrels after 500-700 rounds, and in some cases, as little as 300 rounds. 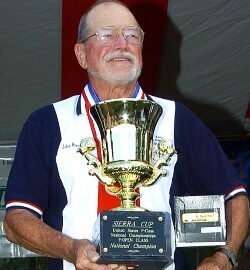 It may be that to obtain benchrest competitive accuracy, i.e. a barrel capable of shooting “zero” groups, you have to clean often and brush aggressively. However, many of the 100-200 yard score shooters, whose 30BR guns can shoot in the low ones (when tested for group) are finding that cleaning less often (and less aggressively) has NOT reduced their scores. Furthermore, these 30BR shooters are getting thousands of rounds of accurate life from their barrels. Is a 30BR THAT different from a 6PPC? Or is the short life of PPC barrels attributable, at least in part, to over-cleaning? The short-range PPC group shooters will laugh at you if you suggest that aggressive brushing with bronze brushes, coupled with regular use of JB, is shortening the life of their barrels. However, these same people will acknowledge that their barrels have very short “max-accuracy” life. They consider barrels to be consumables, like powders and primers. I doubt anything will change in the short-range group-shooting game as long as Tony Boyer and other Hall of Famers brush aggressively between groups. Right or wrong, the top dogs believe you can’t shoot winning Aggs without frequent, aggressive brushing. However, the empirical evidence tells me that such aggressive cleaning procedures may also shorten barrel life. I can’t prove that (until we commission a long-term barrel test), but that’s my opinion. Maybe heavy brushing, over time, simply wears down the edges of the lands. Perhaps heavy brushing may rough the flat surfaces inside of the bore, which, in turn, creates more tiny edges to catch fouling, which then necessitates frequent cleaning. It may be a self-perpetuating cycle–aggressive cleaning creating a bore condition that fouls faster and so needs to be brushed (and periodically JB’d) throughout its life cycle. If that’s the case, the PPC guys (with their frequent cleaning) may correctly be doing exactly what it takes to win–once they start down the heavy-brushing path. But the question remains, is there an alternative? Will some top PPC shooters be brave enough to try a minimalist approach? What I would advocate is that, rather than jump right into a heavy brushing regimen, you should consider the alternatives first. Go out and see how your barrel really performs with 25, 35, or even 45 rounds between cleanings. Log your group sizes and check for variances in velocity. There are those who say going long intervals between cleaning will damage barrels. I haven’t really seen the evidence of that. What I do see is a lot of PPC barrels worn-out after 600 rounds when they’ve been brushed aggressively every 10 rounds or so. I don’t see quality barrels giving up the ghost so early when they have been brushed infrequently, with bronze brushes used sparingly. My own 3-groove, 8-twist 6BR barrel has never seen a brush in over 400 rounds and I’ve never used JB, Rem-Clean, or Iosso paste. I clean with wet patches and Wipe-Out only, and the lands are still very sharp, the crown is undamaged, copper fouling is negligible, there’s no carbon problem, and accuracy is as good as new. I’m not suggesting that my methods will work for top PPC competitors, but for the rest of us, the “less is more” approach is worth trying. Copyright © 2006, AccurateShooter.com | 6mmBR.com, All Rights Reserved. Topics: Bore cleaning, brush, brushing, bronze brush, phosphor bronze, nylon, solvent, Shooters’ Choice, Sweet’s, Bore-Tech Eliminator, Wipe-Out, Foam cleaner, Lucas Guide Rod, Cleaning Rod, patch, jag, Parker-Hale, Carbon Build-up, Carbon Ring, Iosso, JB paste, David Tubb, Dwight Scott, Billy Stevens, 6PPC, 6.5-284, 6BR, 6mm BR, Benchrest, Cross Cross, Moly, Danzac.